September 26 is the 269th day of the year(270th in leap years) in the Gregorian calendar.There are 96 days remaining until the end of the year. 1493 – Pope Alexander VI issues the papal bull Dudum siquidem to the Spanish, extending the grant of new lands he made them in Inter caetera . 1969 – Abbey Road , the last recorded album by The Beatles, is released. The Temple of Venus Genetrix is a ruined temple in the Forum of Caesar, Rome, dedicated to the Roman goddess Venus Genetrix, the goddess of motherhood and domesticity. It was dedicated to the goddess in 46 BCE by Julius Caesar. 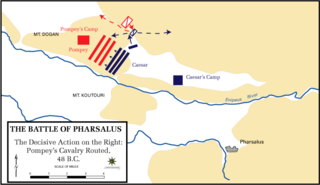 The Battle of Pharsalus was the decisive battle of Caesar's Civil War. On 9 August 48 BC at Pharsalus in central Greece, Gaius Julius Caesar and his allies formed up opposite the army of the republic under the command of Gnaeus Pompeius Magnus. Pompey had the backing of a majority of the senators, of whom many were optimates, and his army significantly outnumbered the veteran Caesarian legions. Year 932 (CMXXXII) was a leap year starting on Sunday of the Julian calendar. Abu Tamim Maad al-Muizz li-Dinillah, also spelled as al-Moezz, was the fourth Fatimid Caliph and 14th Ismaili imam, and reigned from 953 to 975. It was during his caliphate that the center of power of the Arab Fatimid dynasty was moved from afriqiya to then Egypt. Fatimids founded the city of al-Qāhirah "the Victorious" in 969 as the new capital of the Fāṭimid caliphate in Egypt. Year 1329 (MCCCXXIX) was a common year starting on Sunday of the Julian calendar. Berowulf or Berowelf was the bishop of Würzburg from 768 or 769 until his death. Since the 11th century, his name has appeared as Bernwelf. It may also be spelled Berowolf, Bernwulf or Bernulf. Berowulf's predecessor, Megingoz, retired in 768. The Prince-Bishopric of Würzburg was an ecclesiastical principality of the Holy Roman Empire located in Lower Franconia west of the Prince-Bishopric of Bamberg. Würzburg had been a diocese since 743. As definitely established by the Concordat of 1448, bishops in Germany were chosen by the canons of the cathedral chapter and their election was later confirmed by the pope. Following a common practice in Germany, the prince-bishops of Würzburg were frequently elected to other ecclesiastical principalities as well. The last few prince-bishops resided at the Würzburg Residence, which is one of the grandest baroque palaces in Europe. John of Meda, Ord.Hum., also known as John of Como, was an Italian monk of the Humiliati Order and abbot at their monasteries at Milan and Como. He has been declared a saint by the Roman Catholic Church. Saint Nilus the Younger,, , was a monk, abbot, and founder of Italo-Greek monasticism in southern Italy. He is venerated as a saint in the Eastern Orthodox and Roman Catholic churches, and his feast day is celebrated on September 26 in both the Byzantine Calendar and the Roman Martyrology. Wilson Carlile, CH (1847–1942) was an English evangelist who founded the Church Army, and was Prebendary of St Paul's Cathedral. Known as "The Chief," Wilson Carlile has inspired generations of evangelists. 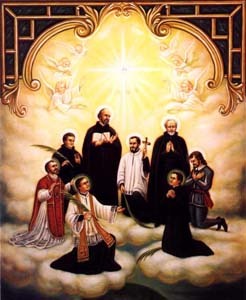 The Canadian Martyrs, also known as the North American Martyrs, were eight Jesuit missionaries from Sainte-Marie among the Hurons. They were ritually tortured and killed on various dates in the mid-17th century in Canada, in what is now southern Ontario, and in upstate New York, during the warfare between the Iroquois and the Huron. They have subsequently been canonized and venerated as martyrs by the Catholic Church. Saints Cosmas and Damian were two Arab physicians, reputedly twin brothers, and early Christian martyrs. They practiced their profession in the seaport of Aegeae, then in the Roman province of Syria. ↑ Das, Bijoyeta. "BUILDING BRIDGES, BUILDING PEACE:The Life and Work of Claudette Werleigh of Haiti" (PDF). University of San Diego. p. 15. Wikimedia Commons has media related to September 26 .